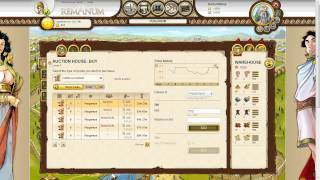 Remanum game - the free browser economic strategy, which are developed in the Roman Empire. As many as 20 towns open to users. And each of them is both internal and external trade. Anyone can be transported on the Mediterranean coast, to take part in an endless race for wealth. Since Remanum online is an economic simulator, it has all the laws of business. You will need to create their own businesses, manufacturing all kinds of products, display products of their labor to sell, and add revenue to invest in the improvement of production in order to improve efficiency. The more advanced your shops, factories, farms or factories - those waiting for a handsome profit after selling another batch of goods. Also, keep an eye on the production process, providing new jobs at existing facilities, to introduce modern technology to another, and in order to leave behind the hated rivals. After all, the richer you are, the higher your ranking, which means that every six months there is a real chance to be the most suitable candidate for the presidency. If lucky, and the size of your wealth outweigh the other candidates, you can enjoy incredible popularity, being the most powerful man in the city. To play the game you can Remanum virtually any computer. System requirements are more than modest. So if your PC is connected to the Internet, after set up an account, will be able to enjoy the game play directly in the browser window. Remanum registration takes just a minute. You will not be easy to enter information into strings such as account name, e-mail address and password (repetition). You should also agree to the rules and put a note that you want to receive notification of valuable developers. You can then select one of the four existing cities and set to build on the empty sites provided its first building. In the merchant's world, of course, everything revolves around the trade. But the game Remanum - this is not only a place for the primitive acts of sale, but also an excellent way to establish diplomatic ties with players from other countries, sign lucrative contract, to be always at the center of political life. Everyone who is not too lazy to make an effort can succeed and win the championship among the citizens of the city. Anyone who started playing Remanum has the right to choose their own path. For example, you can do the production of goods belonging to the category of consumer. It's food, construction materials and supplies. All this will certainly find a buyer, as in the production of similar products everyone needs. Well, if you are a great admirer of beauty, and you want to create a glamorous things, grasp the production of luxury goods, clothing, or learn how to produce equipment that is also one of the expensive goods. All the inhabitants of the fictional universe yearn for a decent life, and agree, sometimes forked out on items that can not be called cheap. That's where you and arrives with its proposals, from which it is difficult to refuse. By the way, you are always entitled to engage in the development of the industry that has the most to their liking. Not necessarily to build a complex chain of buildings to provide themselves with all the necessary raw materials. Something that will be missed, there is always the opportunity to purchase from the neighbors. So concentrate on the main and do not waste power on trifles. Constantly modify their properties and incomes are not only stable, but also growing. Remanum play - so tirelessly committed to the goal! The guys from the German studio Travian Games have tried their best and as a result users are granted the project with good graphics, deep gameplay, with a mass of fascinating detail, an interesting storyline and features. Even those who absolutely nothing about the economy, there may be a great empire, and eventually make her one of the most prosperous. You may be surprised, but really just to get rich. The main thing to have a head on their shoulders and follow your ambition. Passed a training course introduces beginners to date, allows you to feel comfortable in the world of trading pros. Why not try your hand? Declare your intentions publicly, starting Remanum play! Conquer the Roman Empire and ascend to the throne! Do not hide that flatters you the envy of losers, and respect for worthy partners makes sense in your life difficult merchant. Let all your things accompanies luck! Enjoy the game!